Born to an Indian mother and British father, both of whom were members of the Federationm Diplomatic Corps. Both were killed when their shuttle, with Sarah aboard, was attacked by an unknown party and crashed on Veloz Prime, a Maquis colony. Days later, the colony was raided by Starfleet security forces, and a badly injured Sarah was rescued and taken to a starbase medical facility, where she spent some months recovering and rehabilatating. 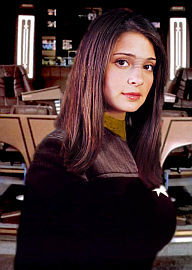 She was adopted by <REDACTED>, and Starfleet became her life. She excelled in her studies, and was accepted on her first application to the Academy. She had been impressed by the Security officers who rescued her, as well as <REDACTED>'s influence, and so she chose Security/Tactical as her specialty. Owing to her connection to <REDACTED>, she has not had many romantic suitors, and has not actively pursued any such activity, apart from the odd weekend-liberty fling or one-night stand. Sarah participates in "extreme sport", such as rock climbing, orbital skydiving, and mixed martial arts. She was on the Academy freestyle wrestling team, and during her junior year won the championship for her weight class. She also played on the Academy Parrisses Squares team for her first two years, but chose to bow out in fear of neglecting her studies. For most of her Academy tenure, she roomed with Kate Jamieson. The two complimented each other well, with Kate helping Sarah pass her Astrophysics exam, and Sarah tutoring Kate on her unarmed combat techniques. The two became best friends, and when off duty are nearly inseperable. General health is excellent; subject is very physically fit. She reports occasional nightmares relating to the shuttle crash which killed her birth parents and left her severely injured and held hostage by the Maquis; she has sought counseling, and there is no indication that the nightmares will ever adversely affect her performance. She has some old injuries from her participation on the Starfleet Academy Parrises Squares team, none of which was serious.